Bangkok is one of the fastest growing cities , with a dynamic economy and a progressive community in Southeast Asia . The town is being developed into a regional center to rival Singapore and Hong Kong , but still have problems in infrastructure and social sectors as a result of rapid development . Bangkok has long been a gateway for foreign investors who want to look for new markets in Asia . The city is also noted as one of the cities in the world with a rate of increase of construction skyscraper fastest . Rich in cultural sites make Bangkok one of the most popular tourist destinations in the world .Bangkok Province borders six other provinces : Nonthaburi , Pathum Thani , Chachoengsao , Samut Prakan , Samut Sakhon and Nakhon Pathom . Bangkok special administrative area covers an area of ​​1586.7 km ² , making it the 68th largest province in Thailand . 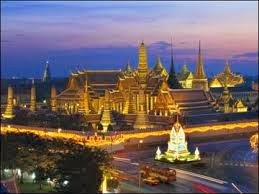 Most of the area is considered part of the city of Bangkok , making Bangkok as one of the greatest cities in the world . The Chao Phraya River , which along 372 km , is Bangkok's main geographical feature . Chao Phraya River Valley , areas around Bangkok , and the nearby provinces comprise a series of plains and river deltas that lead into the Bay of Bangkok about 30 km south of the city center . These conditions gave rise to the title " Venice of the East" because of the many Bangkok canals and waterways that divide the area into a small patch of land separated . In the past , these canals are used as a boundary between the districts with other districts . However , along with the rapid growth of the city in the mid- 20th century , the division of the area by the canal system was abandoned and a new frontier of different applied . Bangkok lies about two meters above sea level , which poses problems for the protection of the city against floods during the rainy season ( monsoon ) . Often after a downpour , water in canals and the river overflows the banks of the river and caused massive flooding . The Bangkok Metropolitan Administration ( BMA ) has recently installed alongside some canals to keep water levels of the canals . Besides extensive network of canals in Bangkok , rumored ( rumored ) that the height of the ground Bangkok dropped about two inches a year as it lies entirely on a swamp . In fact , some reports say that Bangkok ground level down as much as four inches each year , and when combined with the rise in sea level will cause the Bangkok city sinks deep as 50 to 100 cm in 2025 . Bangkok has a tropical monsoon climate by Koppen climate classification system . It is said that Bangkok has an average highest temperature in the world . The average temperature in Bangkok is about 2 ° C higher than that mentioned the Don Mueang Airport during the period 1960-1990 . Hottest temperature was 40.8 ° C and the coldest temperature was 9.9 ° C. The coldest temperatures were recorded in January 1955 , January 1974 and December 1999 . In December 1999 , the temperature at noon only reaches 22.3 ° C. Rainstorm ( hailstorms ) are rare in Bangkok , only happens once recorded in the last 50 years . Bangkok has 50 districts or Khet , which signifies government subdivisions under the authority of the Bangkok Metropolitan Administration ( BMA ) , but the area of ​​these districts may not show the actual division of the Bangkok neighborhood . Within a few years , Bangkok grew from a city spread unevenly along the river into a metro area ( Bangkok Metropolitan Area ) which stretches up to six neighboring provinces . The main business districts and residential areas continues to widen . The influx of foreigners from Western countries as well as immigrants from neighboring Laos , Myanmar , Cambodia and several South Asian countries along with the growing population of Thais make increasingly rapid growth of hundreds of housing projects around the metro area - to build community in the area suburbs . Within a few years , these communities then become part of the ' Bangkok highway ' and become another part of this urban jungle . The most important business area of Bangkok include Silom , Bangrak , Pinklao , Sathon , Phra Ram 2 , Petchaburi , Phra Nakhon , Pathumwan . With the expansion of the city tend toward the outskirts , the inner city do not have the room to grow that large , vertically development consequently becoming increasingly prevalent . Bangkok has a registered 1,000 skyscrapers and a 17th tallest building in the world . This amount does not include hundreds of new buildings are expected to contribute to the construction boom in 2007 or a few years into the future . Areas such as Silom - Sathon and Asok have become the main business district of Bangkok since several decades . During the 90s , Thailand experienced the world's highest growth rates and economic transformation , Bangkok therefore undergo drastic changes . Region Ratchadaphisek first converted into a business district along the five kilometer to the north at the same time through the Asok business district . Sukhumvit area , extending along the 15-20 km , which is slowly transformed into a mix of commercial and residential areas ( housing ) . Wireless Road and Chitlom are some of the most expensive building site available in Bangkok . Part of the British Embassy on the corner (corner ) Wireless and Rama I roads , covering an area of ​​approximately 14,400 m² , was sold for USD 92 million or THB 3.24 billion , also became a land of the most expensive ever in Thailand . Phra Nakhon and Dusit District is the region where most of the offices of government agencies and ministries are located . Many famous historical tourist attractions are also located in these two locations . This area is a free zone skyscrapers to preserve buildings of the same age with Thailand 's own age . The buildings in question , as well -known and leading tourist attractions is the Grand Palace , Democracy Monument , the Giant Swing and Sanam Luang . Victory Monument is the biggest bus destinations in the city . Although not officially called the bus terminal , location right in the center making it the largest city with 20 bus lines '' and '' BTS Skytrain station . The area north and east of Bangkok primarily residential areas for middle class . While the city center often offers apartment - small and low-rise apartment for immigrant - imgran poor . Lad Prao and Sri Nakarin offer housing complexes and townhouses . The second area covers an area of ​​100 km ² -150 km ² , respectively , and become part of a residential development in the area east and north of Bangkok . In the western part of Bangkok there are similar areas called Thon Buri . Suvarnabhumi International Airport is often regarded as a stepping stone for development in the region while East Bangkok Don Muang Airport Bangkok is in the North . Sukhumvit is Bangkok 's main shopping district . " Central World Plaza " which is intended as a newly renovated open field ( square ) for the citizens of Bangkok . Not far from Central World Plaza is Siam Square , just like Shinjuku in Tokyo and Oxford Street and Piccadilly Circus in London . Meanwhile , other areas , Sukhumvit commonly visited by foreigners . " Chatuchak Weekend Market " in north Bangkok is a place where people come to buy quality goods at low prices . The poorest districts in Bangkok are spread throughout the city . But , mostly concentrated in the area north of the Port of Bangkok near the Chao Phraya river bend . Covering an area of ​​10 km ² , Khlong Toei residential district is the poorest in Thailand . Characteristics are half-finished houses with several floors high . The location is generally populated by immigrants and workers - pekrja of Isan province in northeast Bangkok .